The seat sharing formula reached between the BSP and SP is not on the basis of who emerged stronger in the previous election. The politically important state of Uttar Pradesh will go to the polls in 7 phases to select 80 MPs for the next Lok Sabha. Uttar Pradesh sends the most MPs to the Lower House of Parliament. In 2014, Narendra Damodardas Modi's Bharatiya Janata Party won 71 seats while its ally the Apna Dal won two seats. The Samajwadi Party won 5 seats while Mayawati's Bahujan Samaj Party drew a blank. The Congress only won Amethi and Rae Bareli. Before the March 2017 assembly election in Uttar Pradesh, the Congress and the Akhilesh Yadav led Samajwadi Party formed an alliance to take on the BJP. This alliance was drubbed by the BJP which won 312 seats in the 403-member UP assembly. BJP allies Apna Dal-S and the Suheldev Bhartiya Samaj Party won 9 and 4 assembly seats respectively, taking the National Democratic Alliance's tally to 325 in the UP assembly. The SP won 47 seats while the Congress won seven seats. The BSP won just 19 seats. Keeping in mind the dismal perfomance in the previous two elections in Uttar Pradesh, the BSP and SP has forged a pre-poll allaince to take on the BJP in the coming Lok Sabha election. The Congress has been kept out of the BSP-SP alliance. The SP will contest 37 seats, the BSP 38 seats while the Ajit Singh-led Rashtriya Lok Dal will contest three seats in western UP. The alliance will not filed candidates in Amethi and Rae Bareli where Rahul Gandhi and his mother Sonia Gandhi will contest. 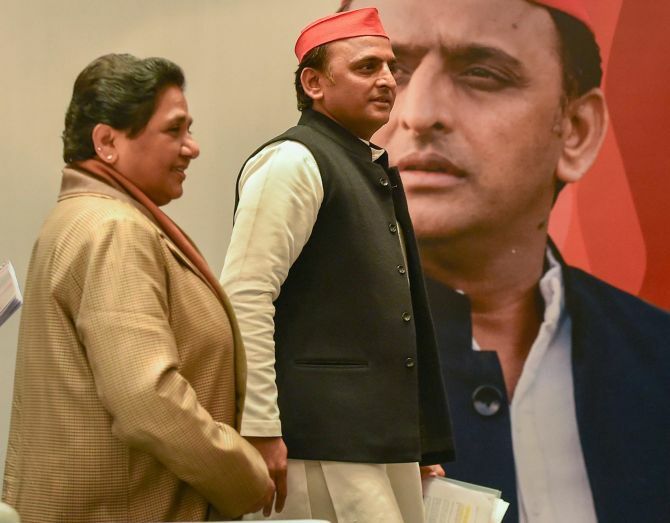 The BSP-SP seat sharing formula is not on the basis of who emerged stronger in the previous election. The BSP emerged stronger in 26 seats as compared to the SP. These seats have been retained by the BSP for the 2019 election. 12 seats -- Amroha, Aonla, Bijnor, Budaun, Farrukhabad, Gautam Buddh Nagar, Ghazipur, Hamirpur, Kaisergang, Lalganj, Nagina and Shrawasti -- where the SP emerged stronger, have now been alloted to the BSP. 23 seats where the SP emerged stronger of the two parties have been retained by the party. 14 seats -- Banda, Bansgaon, Chandauli, Ghaziabad, Hardoi, Hathras, Kanpur, Kheri, Kushi Nagar, Lucknow, Maharajganj, Mirzapur, Robertsganj and Varanasi -- where the BSP emerged stronger have been alloted to the SP. The BSP had emerged stronger than the SP in 27 seats and all those 27 seats have been retained by Mayawati for the coming election. On the other hand, 18 seats where the SP emerged stronger have been retained by Akhilesh Yadav's party. The BSP has been allotted 11 seats where the SP emerged stronger of the two: Amroha, Aonla, Badaun, Bulandshahr, Farrukhabad, Ghazipur, Kaiserganj, Mohanlalganj, Nagina, Shahjahanpur and Shrawasti. Similarly, the SP has been allotted 19 seats on which Mayawati's party emerged as the stronger contender of the two: Azamgarh, Baghpat, Banda, Bansgaon, Basti, Chandauli, Etah, Ghaziabad, Gorakhpur, Hathras, Kanpur, Kheri, Kushi Nagar, Lucknow, Maharajganj, Mirzapur, Robertsganj, Unnao and Varanasi.